More than halfway through the presidential primary season, most Americans are skeptical that the primary process has been a good way of determining the best-qualified nominee from each party. But there are differences between supporters of the various candidates on whether the primary process overall is a good way of picking the most qualified standard-bearer, with supporters of Donald Trump standing out in their positive assessment of the primaries so far. Just 35% of voters say that the primaries have been a good way of determining the best-qualified nominees, a recent Pew Research Center survey on issues and the campaign has found. This is a smaller share than said so during the 2008 election but is on par with views of the primary process in 1992, 1996 and 2000. Republican voters are more likely than Democratic voters to say the primary process has been a good way of determining the best-qualified nominees. But about half of Republicans (55%) and a clear majority of Democrats (68%) think the primaries so far have not been a good way of determining the best-qualified nominees. While there are partisan differences in these views, there are substantial divides within the parties, particularly the GOP – with Trump supporters expressing the most positive views of the primary process. A majority of Republican voters who support Trump (60%) say the primaries have been a good way of determining the best-qualified nominees. 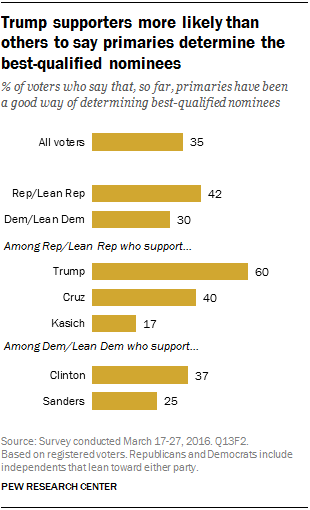 Majorities of the supporters of every other candidate say that the primaries so far have not been a good way of determining who is best-qualified. Among Republican voters supporting John Kasich, fully 82% say the primaries have not been a good way of determining who the best-qualified nominees are. Republican voters supporting Ted Cruz have less negative views of the primaries, but 59% still say the primaries have not been a good way of determining the best-qualified of the candidates. On the other side of the aisle, Democratic voters supporting Hillary Clinton are more likely to say the primaries have been a good way of determining the best-qualified nominees than the supporters of Bernie Sanders are (37% vs. 25%). But majorities of supporters of both candidates say that the primary process so far generally has not been a good way of determining who the best-qualified candidates are. Another aspect of campaigns that is frowned upon by voters is the use of personal insults by candidates. In a race that has been punctuated by harsh personal attacks, 68% of voters say that “personally insulting political opponents is never fair game.” Just 30% say personal attacks are sometimes fair game. Majorities of both Republican (60%) and Democratic voters (74%) say that personally insulting political opponents is never fair game. Majorities of supporters of most candidates say that personal insults are “never fair game” but supporters of Trump are divided, with nearly half saying personal insults are sometimes fair game. Nearly as many Republican voters supporting Trump say personally insulting an opponent is sometimes fair game (47%) as say such insults are never fair game (51%). Among Republican supporters of Cruz and Kasich, nearly two-thirds or more say personal insults are never fair game. Fully three-quarters of Democratic voters supporting Clinton (74%) or supporting Sanders (74%) say that personally insulting political opponents is never acceptable.